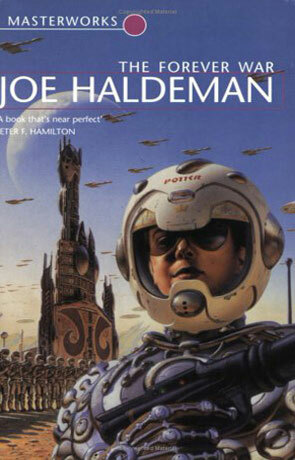 The Forever War is the Hugo and Nebula award winning military science fiction novel by Joe Haldeman. Originally written in 1974, the novel begins in the relative future of 1997 where thanks to the discovery of the collapsars - wormhole type gates that allow faster than light travel between the stars, mankind has spread out into deep space. It isn't long before they encounter their first alien race - known as The Tauran, in even less time they are at war. The most intelligent and gifted young people are drafted to form an elite military unit and are sent to fight in this interstellar war that so far no one knows anything about. One of these young soldiers is Private William Mandella, if he manages to survive the attack against the enemy his real test will be when he returns home, due to relativity a few months duty and travel through the collapsars will mean decades, even centuries could have passed when he returns home to Earth. This is a concept known as "time dilation" space travel where the observed time is relative from the point of the observer, effected mostly by large gravitational masses (black holes being the most prevalent). This effect arises from the nature of space-time as described by the theory of relativity. Although this novel begins in our past - 1997 (the authors relative future), as the first half of the book is set off world it doesn't really seem dated (excepting the fact that deep space travel exists in 1997). The author makes good use of technology with personal communicators, powered space suits and futuristic weapons and when Mandella eventually returns to earth it's 2024, which is of course our future anyway. I love the idea of relative time dilation used here, it lends an incredible vision of someone increasingly loosing touch with his own race, where for him time moves normally out in space fighting the aliens but finds decades or even centuries have passed when he returns. It's an interesting idea which is explored here to great effect and is used as a vehicle to examine the psychological effects that this would have on humanity. The quality of the prose is excellent, with a very natural and easy to read style that belies the deep insights into the inhumanity of war and the seemingly illogical bureaucracy that always seems a part of any war effort. At the same time the novel also explores themes of sexual liberty (with undertones of sexism), casual drug use and capitalism. There are a lot of very nice touches which seem slight toungue in cheek nods to starship troopers, it's one of the few books that made me smile while still reading the first page and laugh out loud reading page 2, a great start. I am very surprised at how well the book has aged, despite being 36 years old it mentions many technologies that exist now such as personal communication devices, while also giving a vision of the future that doesn't seem all that far fetched. There are of course a few areas that we have advanced in and seem old fashioned now, like the size of computers, the absence of portable media devices and a lack of social interaction via such devices. The underlying messages though are just as relevant now as they were when they were written all that time ago (with the possible exception of sexism and the equality of women), suggesting that while our society has advanced tremendously technologically in the last 36 years, we haven't really developed that far socially or politically. The Forever War is an intelligent and thought provoking military science fiction novel, vast in scope and yet offering a very personal journey through the savagery of war and administrative idiocity. Written on 11th March 2011 by Ant.